Junglee Rummy welcomes you to play cash rummy games with the biggest bonus ever! Get 100% Bonus up to Rs.1500 on your deposit and boost your money to win big! You can avail the Welcome Bonus only when you make your first deposit on JungleeRummy.com. The code to activate the bonus is WIN1500. Once you deposit with the code, you can get 100% bonus up to Rs.1500 while playing cash rummy games. 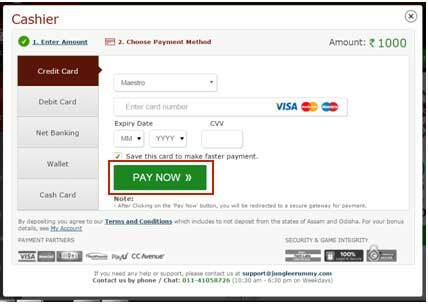 Step 1: Log in to your Junglee Rummy Account and click on the ADD CASH INSTANTLY Button. Step 2: Use the promo code WIN1500 on a min deposit of Rs.100 and click on the CONTINUE button. Step 3: Choose your method of payment (Credit Card/Debit Card/Net Banking/Wallet/Cash Card) and click on the PAY NOW button. Your Welcome Bonus will get disbursed to your account while you play cash rummy games. The bonus shall be disbursed from your Bonus Balance to your Main Account at a rate of 20% of the winnings you pay to your opponent when he/she wins a game. 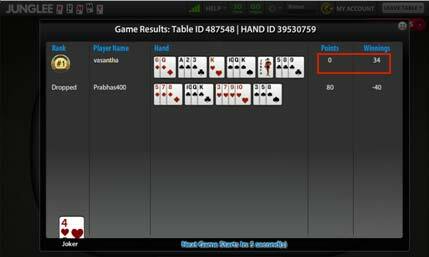 For example - If you play on a Rs.40 cash table and lose the game with 80 points, the amount you pay to your opponent will be Rs.34. As you have paid Rs.34 to your opponent, you will instantly receive Rs.6.80 (20% of winnings paid) from your Bonus Balance directly into your Main Account. You can view this bonus disbursement by clicking on the Bonus section in the lobby. You can also view every bonus disbursement by clicking on the Bonuses tab in the My Account Section. The validity of the Welcome Bonus is 30 days from the date of using the Bonus Code. No part of the Welcome Bonus will be added to a player’s account after the 30-day offer period. So play more cash games and use the entire bonus that you can get as the Welcome Bonus. 1. 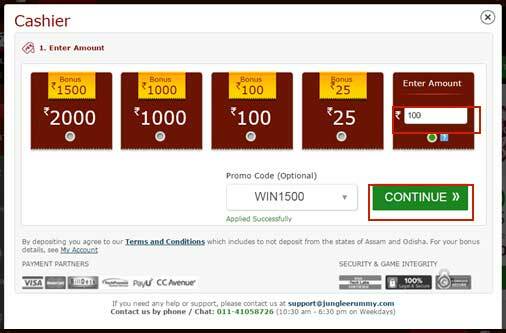 This offer is valid for all players who are depositing cash at JungleeRummy.com. 2. This offer is valid for only 1 transaction per player. 4. Hurry! Offer valid for a limited period only. 5. Welcome Bonus Offer Value: A 100% bonus will be given on the first deposit of up to Rs. 1,500 made during the offer period and using the Bonus Code. Example 1: If you deposit Rs. 1,000, the maximum bonus you will be eligible for will be Rs. 1,000. Example 2: If you deposit Rs. 2,000, the maximum bonus you will be eligible for will be Rs. 1,500. 6. Minimum Cash deposit for availing the Bonus is INR 100. Maximum Bonus amount is INR 1500. 7. Claim Period: The Bonus must be earned (disbursed) within 30 days of depositing cash in the offer period when the cash deposit has been made during the offer period using the promo code. 8. 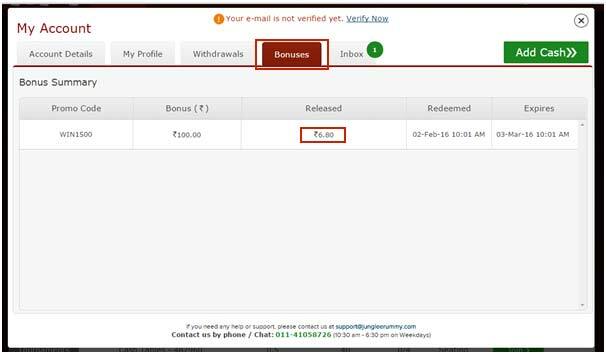 Disbursement of Welcome Bonus Offer: If you deposit Rs 1500 with the WIN1500 bonus code, there will be Rs 1500 more that will be placed in your Bonus Balance. Your Rs 1500 Bonus shall be disbursed from your Bonus Balance to your Main Account, as you play cash games, at a rate of 20% of the winnings you pay to your opponent when he/she wins a game. For example - if you are playing a points game and lose, and your opponent receives Rs 90 from you - you will instantly receive Rs 18 (20% of winnings paid) from your Bonus Balance directly into your Main Account. These disbursements will continue until the bonus expires or until you had received the all of your bonus balance that was allotted when you used the bonus code. You can also see these bonus disbursements by clicking on the 'My Account' button on the top right of your JungleeRummy page and then clicking on 'History' to view your transactions history, including your bonus disbursements after every game. 9. No part of the Welcome Bonus will be added to a player’s account after the 30-day offer period. 10. It is mandatory to use the promo-code while adding cash if you wish to avail the Welcome Bonus. 11. One player can have only one account on JungleeRummy.com. If multiple accounts are detected, the entire bonus amount on all accounts will be forfeited. 12. The Bonus offer may not be claimed in conjunction with any other bonus offers currently offered by Junglee Rummy. Once you activate the bonus code, any previous bonus codes will expire automatically. You will only receive disbursements from the active bonus code. 13. The Welcome Bonus Offer may be withdrawn by JungleeRummy at any time if you violate any conditions of the Terms of Service on www.JungleeRummy.com. 14. The decision of the Junglee Rummy Management is final in case of any disputes.